There are some fantastic pictures of Ruby-throated hummingbirds on the Internet. 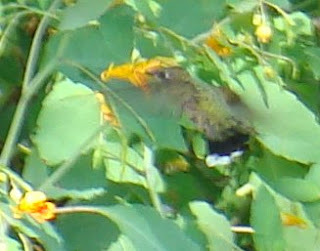 But it is a small proof that I wasn't imagining things when I thought I saw a hummingbird the other night. Wow! You were patient to get this shot. Good job. After I left the previous comment, I decided that I would go look at your very first posts. About 5 years ago, my husband and I were in your position, but we were going to England from Canada. We went through the exact samke things, selling our house, crating and shipping furniture and household items and dealing with all the bureaucracy that goes along with it. Enen though English is our first language, there were many words (slang) that gave us trouble. Many times I was laughing out loud as I read the experiences you had your first year. It is wonderful that you have a written record, you will forget the small things so quickly.